Written by two proven storytellers, Traces of Mercy is a perfect read for anyone who loves historical fiction, prairie-based tales, or just a good romance. I started this book around a month ago on my kindle. 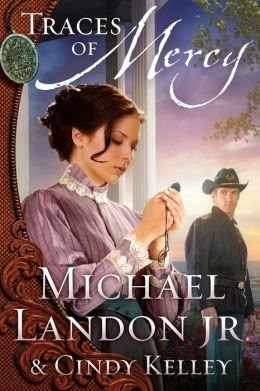 I was very excited to read a book co-authored by Michael Landon Jr., I am a huge fan of the Love Comes Softly movie series. I was at 48% when I threw my kindle down and gave up of boredom. I’m not even sure why exactly, it certainly wasn’t the writing style or the plotline; both were interesting enough. I just couldn’t connect with the characters. So I gave up, thinking I would later write a 1 star review and that would be that. I was browsing my kindle title when I noticed Traces of Mercy, and for some reason I decided to give it one more shot. After only a few pages in, I was immediately hooked by the way the story was turning. The characters suddenly held more appeal. I had stopped just before they had actually become relatable. Figures. This tale of mercy begins when a Confederate sniper spares the life of a Union captain in a moment of humanity. Soon after this, the sniper is injured and wakes up in a doctor’s office with complete memory loss. She has no idea who she is or where she came from. As she’s on the mend, the doctor who helped her soon sends her off to a convent. The nuns name her Mercy, because of her single possession of a Lady of Mercy medallion she wears around her neck. Slowly but surely the convent becomes Mercy’s home. She falls in love with an eligible bachelor who I severely disliked. Happy for a while, soon her mysterious past catches up with her and this is when the action begins. Overall, I rate the first 48% of this book a 1 star. The last 52%, however? 5 stars! This book went places that surprised and excited me! A certain character (*cough* a handsome one at that) was introduced who just made the book. It left me wanting more! I cannot wait for the next in this series. But because of the extremely slow first half, I decided to rate Traces of Mercy 3 stars. However, I would recommend this book as a pleasant historical fiction filled with drama, mystery, and faith! **I received this book for free through NetGalley in exchange for an honest review. All thoughts are completely my own.